Posted February 3, 2015 by Sage & filed under Coaching, Media, Race Reports, Recovery, Training and Racing, Yoga. I had a lovely conversation with Matt Johnson of the Runner Academy podcast. He asked wonderful questions in our discussion, which ranged from yoga to racing and beyond. 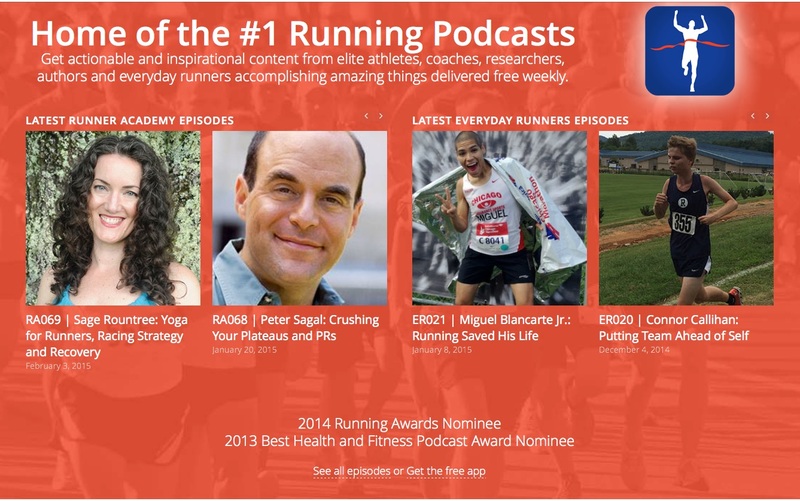 You can stream or download the podcast directly from the Runner Academy site or in iTunes. Side note: if you look at the stellar roster of previous guests of the podcast, you’ll see that this is the only situation EVER where Peter Sagal will open for me, just as the list of members of the Runner’s World Advisory Board on the magazine’s masthead is the only place EVER where I will come in ahead of Joan Samuelson. I’ll take what I can get! Sage Rountree is an internationally recognized authority in yoga for athletes and an endurance sports coach specializing in athletic recovery. Sage is the author of six books, some of which include The Athlete’s Guide to Yoga, The Athlete’s Guide to Recovery, Racing Wisely and an upcoming release Everyday Yoga, which will be released in June 2015. She also has a decade of experience teaching yoga, owns two yoga studios in North Carolina and is an experienced registered yoga teacher at the highest level with the Yoga Alliance. Sage teaches both students and aspiring Yoga teachers alike with her students including casual athletes, Olympians, NBA and NFL players, and many University of North Carolina athletes and coaches. Sage also competes in running races from the 400m to the ultramarathon and triathlons from the super sprint to the Ironman. She holds coaching certifications from USA Triathlon, the Road Runners Club of America and writes for publications including Runner’s World, Yoga Journal, and USA Triathlon Magazine. Taking action on the things in your training that you are least confident about.